They inhabit the enchanted realm of dreams and legends, often crossing the threshold between this world and the otherworld. With the ability to bestow great gifts in favored or wreak household havoc if angered, fairies have long been much loved and often feared in the Celtic Lands. 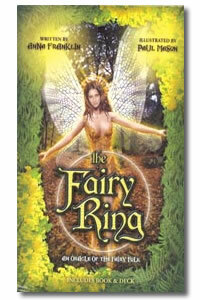 Listen to the wisdom of the little people as they speak through the cards of the fairy ring. This new oracle will enchant with its evocative artwork as it enlightens with insightful readings. The full sized guidebook includes fair lore, upright and reversed car interpretations, and 9 unique card layouts.